"These findings add to the possibility that Enceladus, which contains a subsurface ocean and displays remarkable geologic activity, could contain environments suitable for living organisms," said John Grunsfeld astronaut and associate administrator of NASA's Science Mission Directorate in Washington. "The locations in our solar system where extreme environments occur in which life might exist may bring us closer to answering the question: are we alone in the Universe." The implications of such activity on a world other than our planet open up unprecedented scientific possibilities. "It's very exciting that we can use these tiny grains of rock, spewed into space by geysers, to tell us about conditions on — and beneath — the ocean floor of an icy moon," said the paper's lead author Sean Hsu, a postdoctoral researcher at the University of Colorado at Boulder. Cassini's cosmic dust analyzer (CDA) instrument repeatedly detected miniscule rock particles rich in silicon, even before Cassini entered Saturn's orbit in 2004. By process of elimination, the CDA team concluded these particles must be grains of silica, which is found in sand and the mineral quartz on Earth. The consistent size of the grains observed by Cassini, the largest of which were 6 to 9 nanometers, was the clue that told the researchers a specific process likely was responsible. On Earth, the most common way to form silica grains of this size is hydrothermal activity under a specific range of conditions; namely, when slightly alkaline and salty water that is super-saturated with silica undergoes a big drop in temperature. "We methodically searched for alternate explanations for the nanosilica grains, but every new result pointed to a single, most likely origin," said co-author Frank Postberg, a Cassini CDA team scientist at Heidelberg University in Germany. 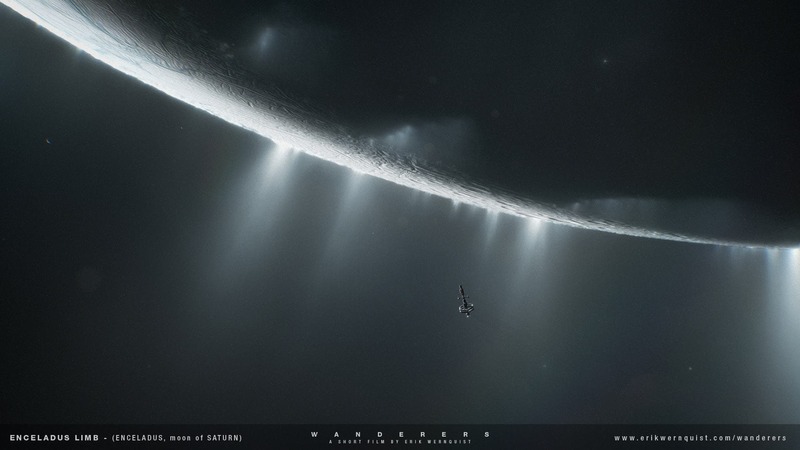 The authors point out that Cassini's gravity measurements suggest Enceladus' rocky core is quite porous, which would allow water from the ocean to percolate into the interior. This would provide a huge surface area where rock and water could interact. The second paper, recently published in Geophysical Research Letters, suggests hydrothermal activity as one of two likely sources of methane in the plume of gas and ice particles that erupts from the south polar region of Enceladus. 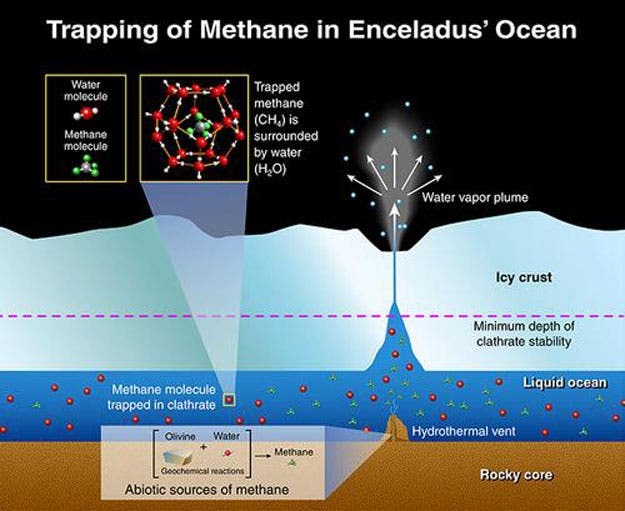 The finding is the result of extensive modeling by French and American scientists to address why methane, as previously sampled by Cassini, is curiously abundant in the plume. The Cassini-Huygens mission is a cooperative project of NASA, ESA (European Space Agency) and the Italian Space Agency. NASA's Jet Propulsion Laboratory in Pasadena, California, manages the mission for the agency's Science Mission Directorate in Washington. The Cassini CDA instrument was provided by the German Aerospace Center. The instrument team, led by Ralf Srama, is based at the University of Stuttgart in Germany.